PROSOPAGNOSIA (n.) From Greek [prosp = face; agnosia = lack of knowledge]. Face-blindness; a neurological condition that renders a person incapable of recognizing faces. It is unrelated to the person's ability to see faces. Someone with perfect vision can suffer from prosopagnosia. It is also unrelated to the person's IQ. In the normal brain there is a center that is dedicated to face recognition. Prosopagnosia arises when that special center becomes damaged or is otherwise unable to perform its function. Imagine a world where you don't recognize the human face. That's Hannah's condition - prosopagnosia, or 'face blindness' - when the brain center that recognizes faces is inoperable. The onset of the condition occurred when she was attacked and nearly raped by an unknown assailant in the inner lobby of her New York City apartment building. And now she thinks he's back, and not just in her dreams. Face Blind by Raymond Benson. ISBN: 1-904433-10-3. Click here to buy FACE BLIND from Amazon.com. 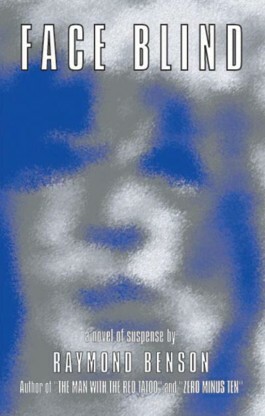 Click here to buy FACE BLIND from Amazon.co.uk. Click here to buy FACE BLIND from Barnes&Noble.com. Alternatively, you may order Face Blind from any bookshop or online bookstore by quoting ISBN number 1-904433-10-3. Click here to read Daniel Dykes' interview with Raymond Benson. To read any chapter online click on any chapter on the vertical menu to the right at the top of the page. To download an excerpt of FACE BLIND click here.